ODM is one of the market leading international companies in producing custom promotional merchandise. 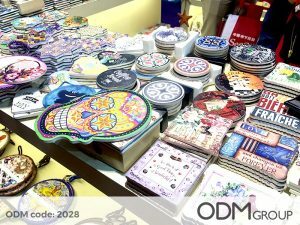 ODM take marketing and merchandising with a new and innovative approach to ensure that companies get the best quality custom promotional merchandise on the market whether in China or across the globe. Companies are always looking to get ahead in the marketing sector, having the right custom promotional merchandise can set you on that path. Many companies strive to ensure their merchandising is strong for long term success. Our Mindsparkz team ensures premium quality design and work closely with our team of merchandisers to amalgamate low cost sourcing with proficient manufacturing solutions. Our custom promotional merchandise is quality checked to maintain high standards. We are More than Happy To Help Your Company Grow with Effective Marketing Solutions. Associate with the ODM Group to know more about our custom promotional merchandise. Revered as the best amongst different promotional merchandise companies, we visit factories to ensure our merchandising items are of the finest quality. We demand your products to arrive as you requested. 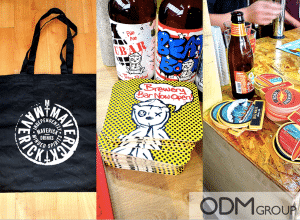 Representing an array of companies identity via our merchandising items is important to us here at ODM. Made from some of the finest and most innovative materials, our products ensure longevity and build quality like no other. Inspired graphic and product designers are waiting to create brilliant new ideas for your next campaign. Our custom promotional merchandise ideas consultants are ready to assist you with the process. Subscribe to our blog to receive new blog updates. You can also connect with the professionals for detailed inquiries. 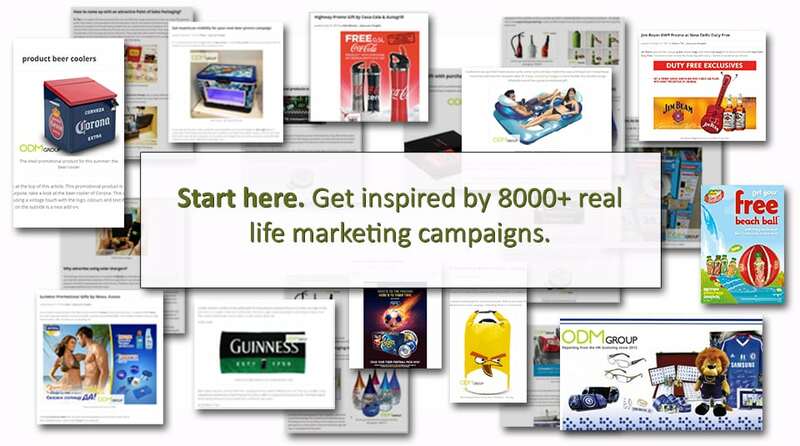 With over 8,000 case studies from around the world on our blog, we know how to apply effective marketing. You can view many of the merchandising items we have made for an array of companies previously. Brand awareness can increase tenfold with ODM designed custom promotional merchandise. 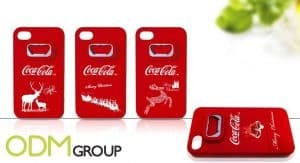 We have put together a list of exciting case studies about custom promotional merchandise. 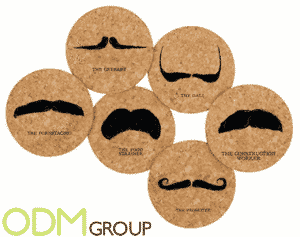 Ever wondered if it’s possible to advertise your brand with custom-shaped coasters? These items will suit any coffee shop or restaurant. Paper ones work around events. Ceramic ones are a great collectible promotion. You can easily turn them into unique promotional products too since it’s quite easy to alter their design. Contact ODM to learn more about how we can help you unique custom merchandise today! 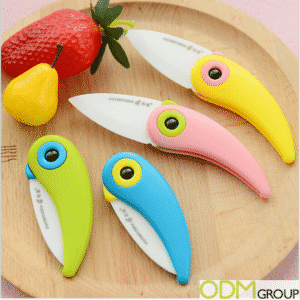 Ceramic knives have grown in popularity over the years and they make great promotional products to attract new customers, which we have previously mentioned on our blog. So why not update your range and offer customers this fun, new custom ceramic knife alongside your next big marketing campaign. Feel free to contact ODM to learn more about how we can help with creative custom promotional merchandise for your project. There’s nothing worse than finding that tea or coffee stain on the surface of your home furnishings, and that is where custom coasters come in as a great promotional idea to prevent this from happening. Contact ODM to learn more about how we ca help create custom promotional merchandise for your next project. In this blog post we would like to tell you about a great promotional gift idea – the customized phone cover opener. The cell phone cover can suit any trendy smart phone. The bottle opener is placed on the back side of the item. This multifunctional product can be great as a gift with purchase, redeemed award or on-pack promo item. If you need help with custom promotional merchandise, speak with ODM. The Football World Cup has passionate fans across the globe. Senior national teams compete in the event, organized by FIFA. So what’s better than a customized sport ball as promotional product? We can help with custom promotional merchandise. Contact ODM today! Imbibe Live is one of the annual events ODM Group can definitely not miss. Indeed, it is a great opportunity to view the latest innovative merchandise ideas and gain more knowledge for our drinks IQ and business acumen. ODM can help you create custom promotional products to enhance your brand campaign. For inquiries, contact us today!